The hosts have a brilliant defensive record while the away team has a very strong offensive line-up, so we could be in for an intriguing clash here in Valencia on Tuesday night. Both of these teams have enjoyed good form over the course of the season and it is likely that the Pabellon Fuente de San Luis will be rocking on Tuesday evening. The Spaniards have been in fine form, grabbing a 7-1 record in the regular season and then following this up with a 6-0 record in the Top 16. When you have a 13-1 record heading into the quarter-final, you have every right to be confident about the task that lies ahead. Mind you, it is not as if Khimki are a weak side and their 10-4 record is the envy of many teams in the EuroCup this season. The Russians bagged a 6-2 record in the regular season and they followed this up with a 4-2 record in the Top 16, so they know how to win games and take care of opponents. Bojan Dubljevic has been in excellent form so far for Valencia, offering an average of 11.2 points per game but with another seven players all on an average of at least 7 points, this is a side that likes to spread their points around. For Khimki, Alexey Shved has been in fantastic form and he is the top scorer in the whole competition, with an average of 22.2 points per game. EJ Rowland, with 10.6, and Jacob Pullen, with 10.2, are two other players in double figures for the Moscow side. The bookies think that the hosts will do the damage in this game but it is a very close one to call. You can see the Spanish side winning but perhaps not by a massive margin. 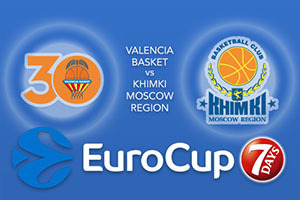 With this in mind, take Khimki Moscow Region at +6.5, which is provided at odds of 1.90. Anybody looking for the Over/Under market will find that going UNDER 164.5 on offer at odds of 1.90 makes sense. Bet Now!